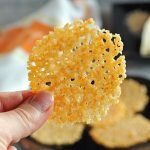 My Mom’s Italian Cookies have a soft texture, thanks to a secret ingredient! These are my favorite cookies! Flavor them with vanilla or anise. 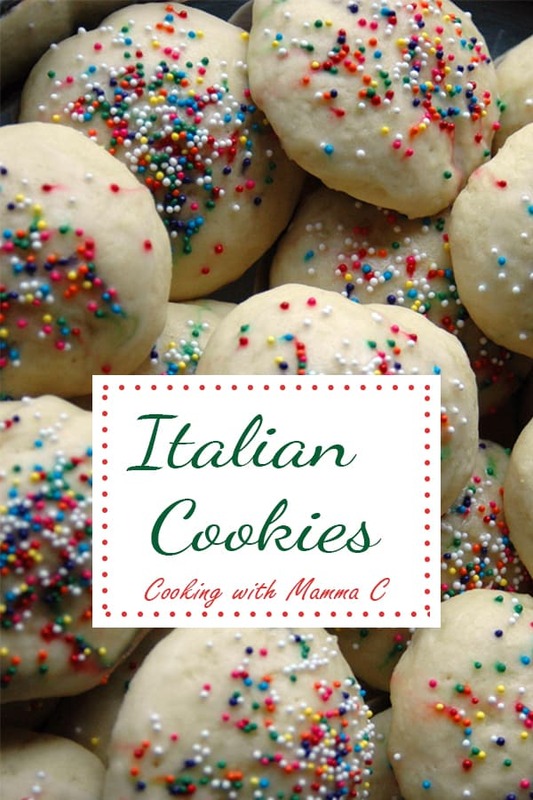 Today, I’m sharing these Italian Cookies as part of the Great Food Blogger Cookie Swap 2014, to benefit Cookies for Kids’ Cancer. This is my first time participating in this annual event, which has raised more than $12,000 this year for such a good cause. Cookies for Kids’ Cancer supports grants for pediatric cancer research to find safer, more effective treatments for kids. Since its launch in 2008 by Gretchen and Larry Witt — whose son Liam was diagnosed at age 2 — the organization’s funding has helped generate nine promising new treatments. These treatments are now in clinical trial and available to children fighting cancer today. As someone whose own household has been affected by cancer, my heart goes out to all families facing this disease, especially those with children fighting this fight. I baked these cookies with love and prayers for these kids. 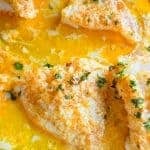 This recipe is so special to me. 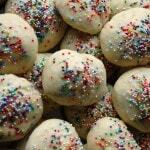 I’ve adapted Mom’s Italian Cookies as I remember them from my childhood. Mom now makes a slightly different version, and just about every Italian family has its own way of making these. 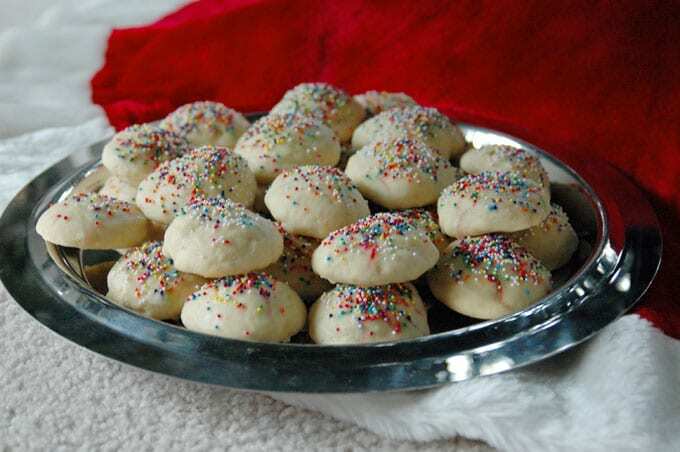 I think of these as Italian sugar cookies. 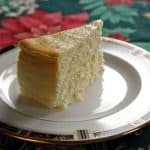 They have a soft, almost cake-like texture, thanks to the addition of half and half to the dough. I’d say the flavor is similar to Cookies by Design, if you’ve ever tried those. Yum! And instead of using the typical glaze, Mom uses a cooked one made with light corn syrup, so the cookies have a glossy, smooth finish. I was so excited the first time I made these. I hadn’t tasted them in so long. And it’s really fun to dip the cookies in the glaze and top them with sprinkles! It’s the perfect job for kids. As part of the cookie swap, I sent my Italian cookies to Kathleen, Alison and Christy. And I received cookies in the mail (so fun!) from Ashley, Aimee and Caitlin. If you’d like to support Cookies for Kids’ Cancer by donating funds, buying cookies or holding a cookie swap or bake sale, click here to learn more. These Italian Cookies have a soft, cake-like texture and a glossy finish from the cooked glaze. Top them with sprinkles for a festive look. Flavor them with vanilla or anise and dip them in your coffee or hot chocolate! Set out 3 sticks of butter to soften at room temperature. In a large bowl, use a mixer to blend the softened butter with the 1 1/4 cups granulated sugar until creamy. Add eggs and vanilla; mix. 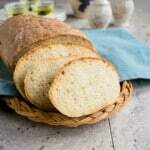 In a separate medium bowl, use a fork to toss together the flour, baking powder and salt. Add some of the flour mixture to the butter mixture, mixing well. Add the half and half and mix. Gradually add the rest of the flour mixture in, beating well after each addition. You will end up with a sticky dough. Cover the bowl of dough with plastic wrap and refrigerate for 30 minutes. During that time, prepare the glaze. In a small saucepan (stainless steel if you have one), whisk the granulated sugar, water and corn syrup together. Cook over medium heat, stirring until the mixture just comes to a boil. Remove the pan from the heat and stir in the vanilla. Let the mixture cool for five minutes. Preheat the oven to 350 degrees F. Line two (four, if you have them) sheet pans with parchment paper (or lightly grease the pans with cooking spray). Place a few tablespoons of flour in a small bowl (for dusting your hands). When the dough is chilled, use two teaspoons or a scoop to measure out some dough. With floured hands, roll the dough into a 2-inch ball and place it on the baking sheet. Continue scooping and rolling, dusting your hands each time. Place the cookies two inches apart on the pan. Refrigerate the dough whenever it gets too soft to work with. Bake the cookies at 350 degrees F for 10-15 minutes, until the tops are set, and the bottoms are lightly browned. (Mine took 13 minutes.) Let the cookies rest for a couple of minutes before placing them on a cooling rack. When the cookies are completely cooled, you can glaze them. 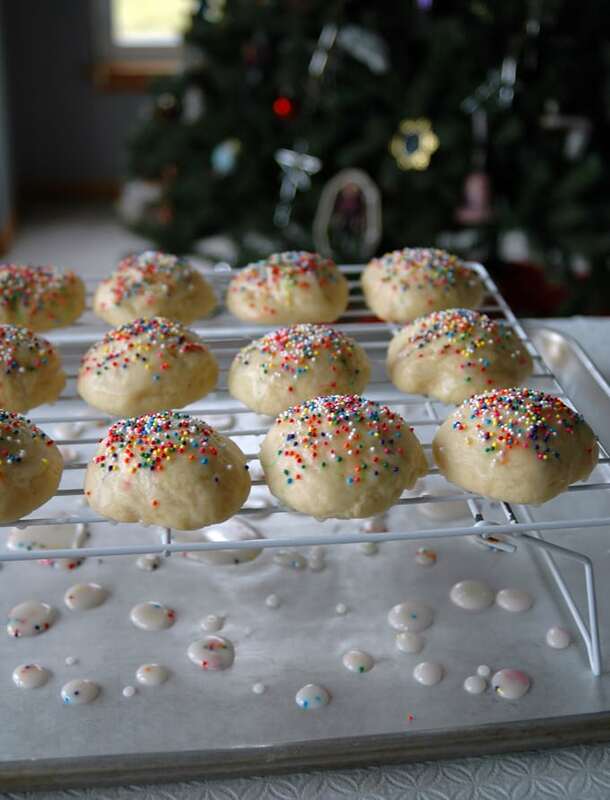 One at a time, dip the cookie in the glaze and immediately sprinkle it with nonpareils. (Don't put on too many, or the colors will bleed.) 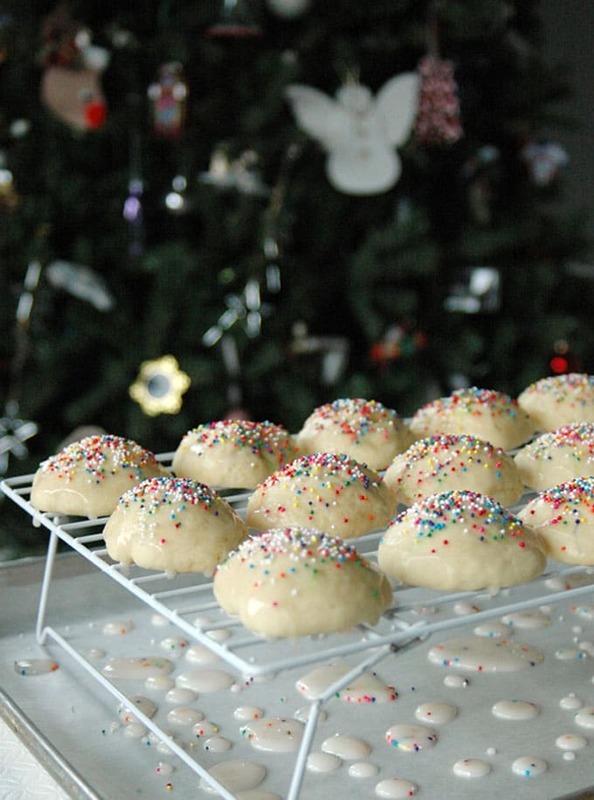 Place the glazed cookies on a cooling rack and set it over a parchment-lined or wax-paper-lined pan to catch the drips. It will take about 4 hours for the glaze to fully dry, so wait to store or package the cookies. Once the glaze has dried, store the cookies covered at room temperature for up to a week. Note that if you use a plastic container, the cookies will become very moist. I like to keep mine on a tray loosely covered with plastic wrap. Any leftover glaze can be kept at room temperature for three days, then refrigerated for a week. You also could freeze the glaze. The cookie dough is very soft and sticky. You will need to refrigerate it for 30 minutes first, then again for several minutes while some of the cookies are baking. Make sure your hands are floured when rolling. If you need to reuse your baking pans as you go, make sure they are cool first, so the cookies don't spread. It helps to rinse the pans in cold water and line them with fresh parchment paper. following all the instructions , why do my cookies split open on top while baking. All the pictures i see of the cookies on the computer are all perfectly round and smooth? Hi John – These never crack when we make them. I’m wondering if it has something to do with your oven. Cookies can split open during baking when a crust forms before the interior dough has finished expanding. If there are convection fans running in your oven, they could dry out the top of the cookies. My family & friends love these cookies! Question – how long can you keep the unbaked dough refrigerated? Hi Dina – We’ve always used the dough right away, but refrigerating it up to two days should be fine. I’d wrap it in plastic and then put it in a sealed container so it doesn’t get dry. I’m glad these cookies are a hit! Try them with almond extract. We also used annisette. My mom used to make Italian cookie trays for weddings and Christmas. I not only helped her, but I was the official taster. Hi Jan – I love almond extract and can’t wait to try it with these cookies! Official taste tester is a tough job, but someone has to do it, Lol. Can these cookies be frozen for a month or so? Hi Patty – That should be fine, but for best results, I would freeze them without the glaze and sprinkles. Hi Betty – I’m not sure what you mean. Are you asking what is half and half or are you asking what is 3.5 ounces? The recipe calls for 3.5 ounces of half and half. That means a little less than half a cup of “half and half,” which is like coffee creamer. Half and half is a product that is half cream and half milk. Such cute cookies! My childhood neighborhood neighbor sends a dozen similar cookies every Christmas and I devour them within the hour. I’m sure your vanilla version is even BETTER! The beauty of these cookies is that everyone can flavor the batter to their liking. I’ll probably try some variations in the future. 🙂 I’m glad to have been a part of the cookie swap with you and other talented bakers! These are beautiful cookies for a beautiful cause. Thanks, Kathy. It’s been a rewarding experience to help out, even in a small way. 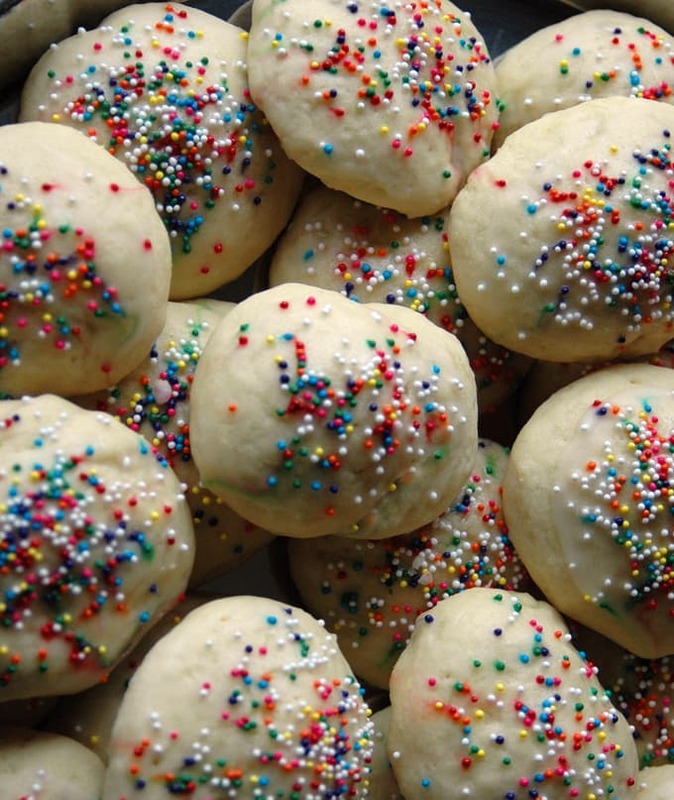 Italian cookies, of course, hold a very special place in my heart! And I was never big on the anise flavor, either! Yours are beautiful…And I love the foundation you’re baking for! I’m glad I’m not the only Italian who isn’t crazy about anise. Thanks, Annie! These are so cute and sound wonderful! Your photos are amazing! I’m glad you think so, Angie! I struggled with the photos for this one and had many rejects, lol. Thanks, Christy. 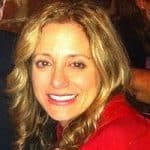 I’m so glad to have found you and your site!